In stock. Order in the next 5 hours and it will go out today! We are all familiar with the classic Magic Funnel. For those of you who do not know it by name, it is the trick where you can produce water from any place with the aid of a funnel. The problem has always been loading the liquid. If you have ever used it, you know that it is a bother to use Scotch tape and all that stuff. If you have not, you do not want to know. Now you can forget about Scotch tape and untimely spilling. 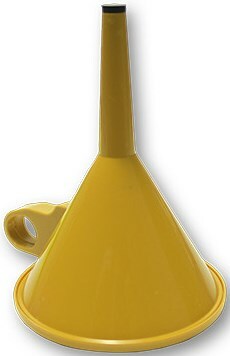 Automatic Funnel, is the one and only plastic magic funnel with a valve. Automatic funnel has been specially build in hard plastic, with a modern look and looks like any regular funnel. It is also available chrome plated look and in the color Yellow.